As Bajor moves to elect its new Kai, Kira investigates the possibility that Vedek Bareil collaborated with Cardassians during the occupation. I've just realized how much the character of Vedek Bareil annoys me. He's just so one-note and boring, and I couldn't care any less about his romance with Kira. Odo's line that "even the best of you is capable of doing terrible things" is a very DS9 perspective, kind of the counterpoint to the more typical Star Trek philosophy that, as long as you work to better yourself, you are capable of building a wonderful future. This is a logical extension of the Bajoran politics arc, but it's a pretty forgettable episode. I get what it's trying to do--by demonstrating that the moral path isn't always clear-cut and perfect--but there is no sense of surprise. The story has the capacity to make Winn a more complex character--much like "The Maquis, Part II" does for Dukat--but Louise Fletcher plays such a great villain that it doesn't work; you love to hate her too much to even consider the possibility that she has a soul. 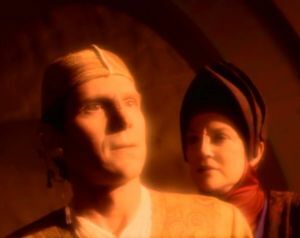 As such, the best thing about this episode is the choice to make Winn the next Kai instead of Bareil, because that promises far more conflict and difficulty for Bajor going forward. DS9 is all about laying groundwork the way no other Trek show has done before, and making Bareil the Kai would just be putting a bow tie on the plot and laying it to rest.